Is there a built-in chat for the DaCast player? 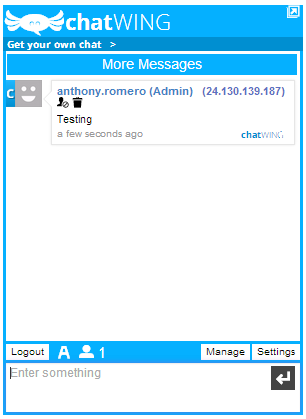 DaCast discontinued the built-in chat feature, so that we can instead deliver to a wider range of mobile devices. Very easy to setup and embed, this platform also offers administration features (remove unwanted chatters) and is simple to customize. Like a lot of chats, you can have user based “avatar” images to represent you as well. In addition, you can have a live counter for how many people are in on chat at any given time. The only downside is that it features a lot of/obvious ChatWing branding. Not a lot of options, but a clean if a little older looking interface. 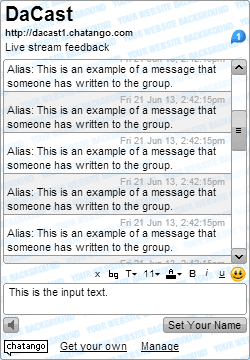 The chat also features audio settings that can be turned on or off, so noises can be made to notify of a new post (although this might interfere with your audio-visual content). The embed is light on branding and puts more focus on your own site in bold if needed.